I think today is the day. Today’s the day I finally lose it. It’s crunch time and everything about this project is a complete mess. My entire team is neck deep in multiple projects and all of them have strict deadlines that need to be adhered to. We have so much on our plates that it’s getting difficult to focus. As if that weren’t bad enough, I feel like we’re spending half of our time just trying to locate and tie together the data that we need to use to complete these assignments. It’s like the world’s worst scavenger hunt and the prize is frustration. We need several applications to get our jobs done, and it’s turning everything into a nightmare. Everything feels like it’s duct-taped together from all of these different sources, and the only reports we have that are easy to make heads or tails of require an IT professional to put them together! I have wasted hours of my life that I will never get back downloading and merging data into excel spreadsheets. My day consists of constantly searching through emails from three months ago to find scattered data which is buried under mountains of junk. Then, of course, there’s the issue of trying to make sense of what I find. There are so many tabs open in my browser that I fear my computer will give up at any minute and go on strike. Unfortunately, I don’t really have any other options. The BI tool that the powers that be expect us to use is from the stone age. It doesn’t have a central repository, and as a result, there are little bits of data, and my sanity spread all over the office. Does this story sound like the recurring nightmare that is your day? If so, then you can use Yurbi to reclaim your data and what’s left of your sanity. 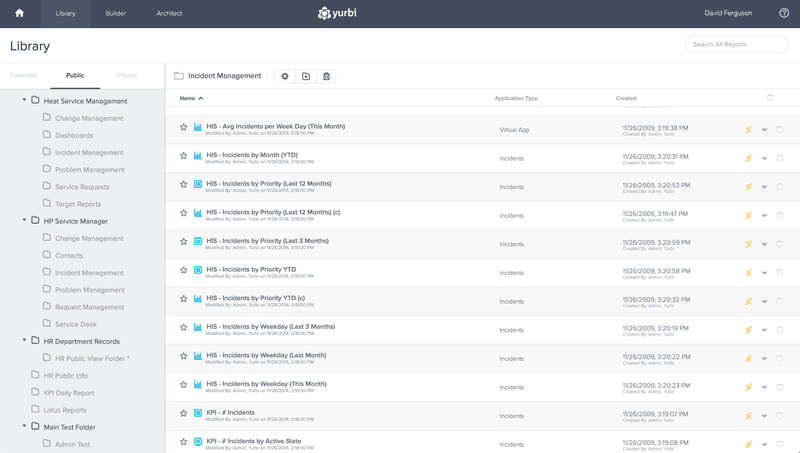 Yurbi offers your entire team a centralized location to view reports, collaborate and get things done faster. It makes your most commonly used reports available with just one click, and it allows collaborations for everyone or just some teams as you see fit. This allows you to improve your workflow while still allowing for your sensitive data to remain secure. You can easily share reports and dashboards via secure and anonymous hyperlinks, or create private folders that are for your eyes only. Yurbi excels at flexibility, so it’s easy to fit our software into your existing business set up. Yurbi’s powerful search features allow you to sort data by things like modify dates, source type, and other details to help you find what you need fast. You can also access Yurbi from nearly any device including your office computer, laptop or even your smartphone. You can even use Yurbi to spot data trends which could be useful to your business. This allows you to transform your workflow and increase efficiency in ways that you never thought possible. Yurbi allows your team to spend less time tracking down important data and more time using it for its intended purpose. Plus, since Yurbi is so easy to use your IT team also wastes less time on helping your team members to learn how to utilize your software solutions. With all of your business reports stored in a centralized location, you’ll never have to worry about whether you’re working with outdated information ever again. With Yurbi, everyone in your organization is on the same page, and that makes for better decision making. Yurbi’s organizational features also make it easy to streamline your operation, and that means everything within the business runs smoother. That’s good news for your team, your customers and your boss, making Yurbi a win for everyone. Interested in learning how Yurbi can transform your team’s workflow? Contact us to discuss your requirements and learn how Yurbi can help you own your data instead of it owning you.